Not only are you warned in CAPS lock to read the entire ad before applying, but your warm and welcoming hostess reminds you that nine out of 10 applicants are denied for not doing so. NO EXCEPTIONS. Should you be welcomed into the elusive fold (step one is to insert the keyword "PumpkinSpice" into the subject line), you will be graced with a futon, which you must vacate every single morning, as you are not allowed to be alone in the apartment without your hostess. There’s nothing quite like Southern hospitality. Talk about getting your $15 worth. Sure, this single futon is located 12 miles south of the city in a four-acre artist community (and well away from the hustle-and-bustle of Sixth St), but with it comes an eclectic array of amenities that includes: “Up to 3 fresh eggs per guest, per day and access to greens from our gardens,” “meditation space for quiet time or yoga,” and, if you time your trip properly, a “live concert series” hosted on the land. The only catch: house rules stipulate that you’re not “allowed to bring people into our home who were not a part of your original reservation. This includes prostitutes and people you meet in a bar.” Consider yourself warned. Technically, TECHNICALLY, this listing is in Cambridge. But Harvard Bridge is like... right there. And for $30 a night, are you really complaining? The room is actually the living room of a two-bedroom apartment, but the balcony will hopefully help you forget you’re just sleeping in a stranger’s living room. Also, dudes need not apply, unless you’re part of a couple. This listing is for females or couples only. 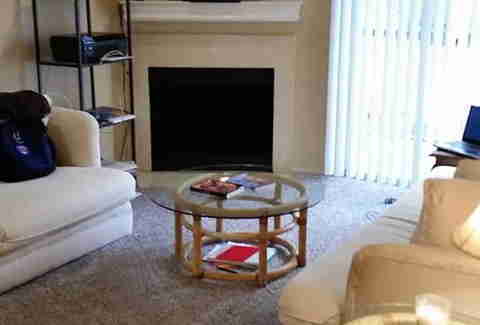 Living room with 3 couches. Be forewarned that the touted three couches in this listing are NOT the best or fanciest couches in the world, so says the owner. 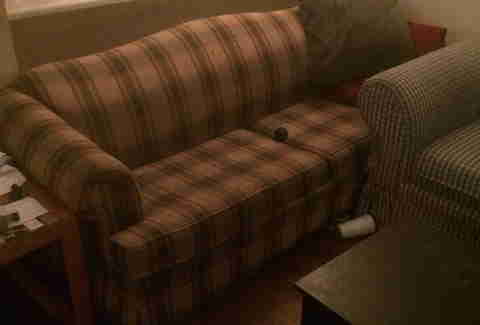 But if you’re fine sleeping on a couch we’re guessing you care very little if it came from Bob’s or Raymour & Flanigan. 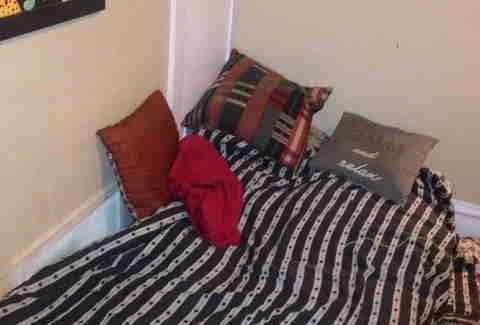 The two other people in this apartment are in their mid-20s and are admittedly never there, sooooo you could always crawl into one of their empty beds in the middle of the night if your regular old non-luxury couch isn’t quite doing it for you. WE WON’T TELL! It’s all about no frills at Carlos’ less-than-chic Pilsen pad. Your $11 is going to get you a futon... and not much else. But since you only want to spend $11 on accommodations, you probably don’t care that there are two other futons that will be occupied by two other strangers and there's no Wi-Fi (but Carlos can share his iPhone hotspot with you). If you need more privacy, Carlos is happy to rent out his bedroom to you for a cool $19 per night. But without Carlos then there’s no Wi-Fi. This private room offers a shared bathroom with access to the kitchen and living room. There’s no cable hookup, but Internet is available. One of the major selling points of this space is that your couch or air mattress will be equipped with sheets AND a blanket. If this is what is being advertised, we can’t imagine there’s much else to get excited about. This dude’s living room doesn’t have cable, but with ample Redbox locations nearby, you’ll be alright. Chances are you won’t be spending much time with the DVD player anyway as this apartment complex has a pool. Pets aren’t allowed, but the host has no problem with you "getting a little bit tipsy," so long as you clean up after yourself. House rules: “Please be extremely quiet. We go to bed early, don’t party and don’t smoke. We keep the house very, very clean and expect the same.” Welp, at least they have a washer/dryer. Air bed, common room, near beach. About a mile from the beach near Hanauma Bay, Sandy Beach, Waikiki, and Diamond Head. Not really sure anything else matters when you’re in Hawaii paying $20 a night. Oh, there’s also free parking. And, um, the beach is right there. The rules are pretty simple at this residence: don’t leave feminine products in the bathroom trash cans, and don’t leave crusty toothpaste in the sink. I think if we all lived by those rules the world would be a better place. Although... where ARE we then supposed to leave our feminine products? You might HAVE to book this option when you inevitably lose all your money and are kicked out of Caesars. Fortunately for you, the apartment is close enough to the Strip so that you can still walk to all the casinos to DEFINITELY win your money back. There is also a swimming pool in the complex so if you can find someone in a bikini to bring you a beer, it’s almost like you’re still at Caesars. The title of the listing says it all, but if you really need more to be sold then you should note that there’s Wi-Fi, stainless steel counters, a yard with a bay window, and it's centrally located to the Sunset Strip, Santa Monica, Venice Beach, and Hollywood. Basically, it’s prime LA real estate, putting you in the heart of the action. The catch? No drugs. Or drinking. And quiet time is from 11pm to 9am. Sooo... if you’re going to LA to party, be sure you’re all wrapped up by 11 or out until breakfast the next day. Simple and easy is the name of the game at this private home. 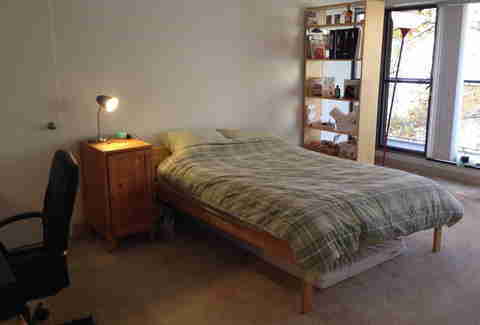 The full room is equipped with a bed and dresser. 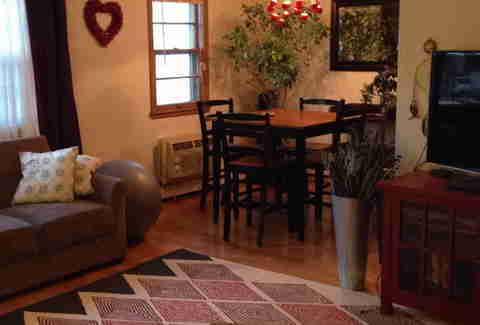 There is also access to a shared bathroom, living room, kitchen, and laundry. Wi-Fi is available, but no cable. There’s not a whole lot to say about this except it’s a pretty excellent deal. Sure, you may be crashing with one or two other strangers all in the same room, but it’s a small price to pay when you’re sleeping in one of Miami’s best neighborhoods for just $20 a night. Besides, if you went to Miami to stay indoors, that’s entirely on you and your poor life choice. 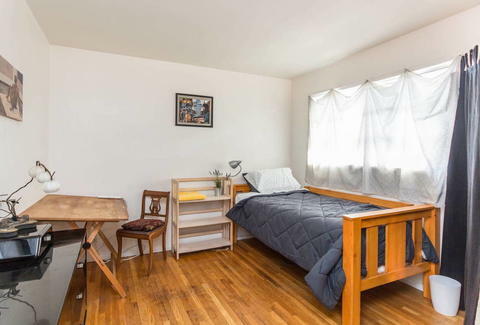 This listing offers a couch that folds down into a futon and not one, but MANY blankets, which makes this apartment straight luxury in the winter. Guests have access to the entire pad, except the host’s private bedroom. There is also a pay-per-load washer and dryer in the basement. 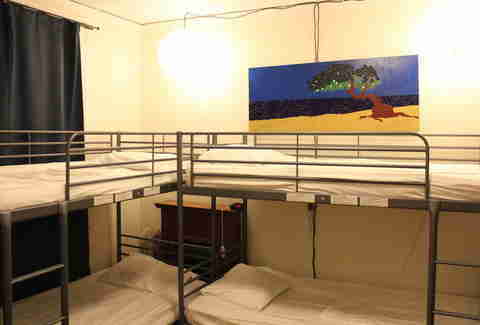 What says "girlfriend getaway" better than a no-boys-allowed, bunk bed-style room in a Tennessee hostel? Spoiler alert: the exact opposite of those things. So if you and your best gal pals are looking to take on Music City in ABSOLUTE style, this is probably NOT the listing for you. However, the locally owned Downtown Hostel is a block away from Broadway, and has free Wi-Fi and laundry services. So, ladies, if you’ve been two-stepping at Robert’s Western World all night with that handsome cowboy, just be sure you’re willing to mount his steed and ride it back to HIS place. Or, you know, just mount it in the bathroom. If you’ve come to the Big Easy to sip dark rum and brood over your manifesto, you will feel wildly uncomfortable at Rosie’s. 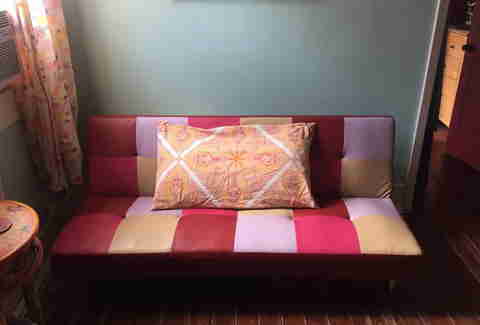 Self-described as a “compassionate, joyous, collective, global human experience wrapped up into authentic, unique, hand tended, well-loved accommodations,” this particular listing is for the CozyCorner single futon. But be on the lookout for all the eco-love, as many furnishings, bedding, decorations, cleaning products, and food are organic, Fair Trade, and/or locally produced. You’re probably going to need to up your dosage to handle all the smiles at Rosie’s. Cynics need not apply. 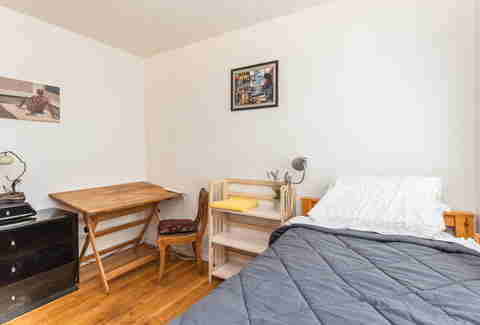 Unless you’re bringing your own cardboard box and staking out a corner of Central Park, you really can’t get a much better deal in Manhattan than this. 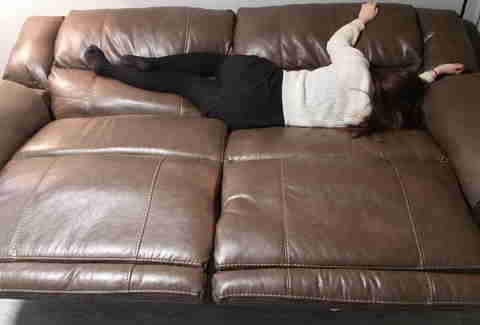 The catch is that the sofa bed must return back to a regular sofa by 8am each day, so you might want to think twice about taking advantage of New York’s 4am last calls. It’s back to the basics at this Philly crash pad. A divider sections off the living room so you can have all the privacy to literally flop down on a bed and pass out. Wi-Fi is pretty much the only amenity... but who cares?! You’re in... Philly. A straightforward private room in a two-bedroom apartment. The only caveats include no window in the bedroom, and a host that will monitor the frequency at which you wash your hands. In case you needed a gentle reminder that you should wash your hands with soap after each bathroom use, host Rachel is on hand to make it a requirement of all her guests. Guests are also asked to wash hands frequently throughout the day, as well. But don’t get the wrong idea; it isn’t ALL business at this Pittsburgh palace. You can TOTALLY discuss the possibility with Rachel about lighting candles. Nothing about this surprises us because, well, Portland. This tent space can fit up to two tents and has power, water, and bathroom access in the house. If you didn’t BYOT, one can be provided for $10. This two-bedroom, two-bathroom apartment is being run like a makeshift hostel in prime PB. You will be sharing the room and the apartment with other people, up to four in total, and the hosts try to separate genders. While that may be a little weird, you’ll probably get over it when you see that the complex has a pool, hot tub, gym, washer, and dryer. It’s all about communal living in San Francisco, so why not do as the locals do and sleep on bunk beds with strangers? This one-bedroom apartment has a bedroom, living room, kitchen, and bathroom. 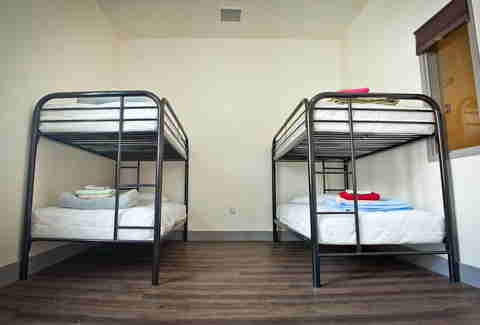 Your room will be the one with the bunk beds and three other people you probably will not know. You’ll forgive the bunk-bed situation at this Seattle pad when you see it’s within walking distance to... everything. Downtown, the International District, Pike Place Market, etc. While your host prefers “quieter” hours after 10pm, he graciously makes up for it by also offering you a free bike to use, probably to ensure that you’re tired enough by 10 that you keep your damn mouth shut. Guests not renting the bunk bed are not permitted to spend the night, but the top bunk is ALSO listed on Airbnb so you can easily bring that special someone you just met at the bar back with you should the listing remain available the night of. No smoking or partying, but it is a cool 25-minute bus ride to the White House, so you pretty much scored. There is a small bed and a sofa bed in the room, which can accommodate up to three people, however the host is totally down with squeezing more in so you can have quiet, calm time with six of your closest pals. Only catch, you gotta bring your own towels. Meagan Drillinger is a contributing writer for Thrillist and once rented out her couch to a random, traveling Austrian after drinking one-too-many whiskeys. It ended up fine, and she ended up not being murdered. Follow her on Twitter, Instagram, and Facebook at @drillinjourneys.